Graphics: whether it’s a graphic tee or a card case, graphics are hot right now! My personal favorite is a good graphic tee. Nothing is more comfortable than a cute tee and jeans for Saturday brunch, am I right?! Embroidery: this is so fun and I’m really ready to take advantage of this trend. These shorts are SO cute and will be perfect for the spring and even summer. I can imagine it with an oversized white tee with a lace barrette underneath it. Suede: I always used to think suede was just for fall/winter but… nope! Suede is all the rage right now and this bag is on the top of my list. I also have this bag from last season and am dying at the new pink color! And if you haven’t had a chance to pick up this moto jacket, do it now! I lost mine a few weeks ago (really upset about it) but am planning on picking up a new one. Block heel: the block heel is a great trend because it means us girls get to be comfortable in heels! This one is especially gorgeous and I love the tassel details. Tassels: speaking of tassels… they’re still in! This bag has the perfect amount of them and I also love these tassel statement earrings and bracelets. Off the shoulder: off the shoulder is still a thing, ladies. Add in eyelet or lace and you’re good to go! I absolutely love this one because of the sleeves. Might have to add it to my cart! Totally love all of these picks. I am digging the block heel and mule trend…it took me a while to get on board as they reminded me of the nineties but I am over that and loving them!! I am also in heaven that the OTS shirts are still going strong…I think they are so romantic and feminine!! I am loving all of these spring trends. Especially the block heels (thank goodness they are trending now) and the pastel colors! Love it all! Those Kate Spade sandals are in my cart! 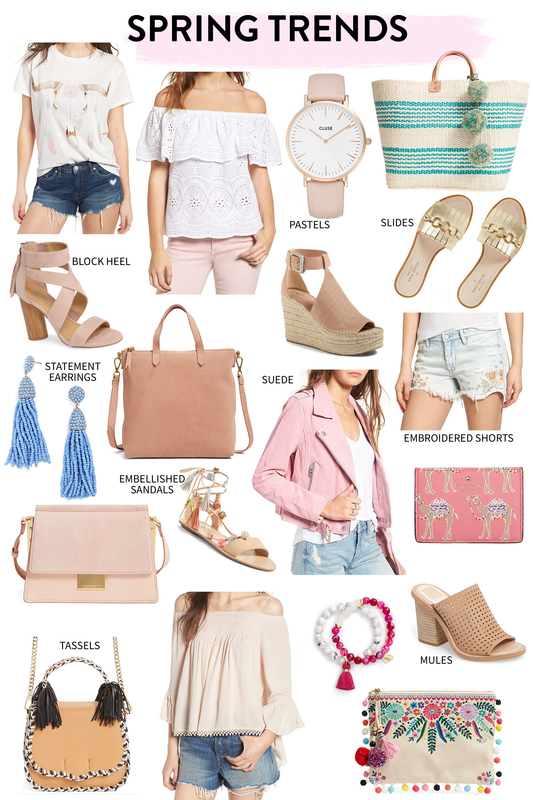 Loving all your fun spring picks! I want one of everything! I love that moto jacket, You have some great picks. I love all of these trends! Those embroidered shorts are so cute! Obsessed with all of these picks! I want all the fringe and pom poms for Spring! That Vince Camuto purse is adorable!! Great roundup! Ok, I legit want EVERYTHING on here! I’ve had my eye on that suede jacket for SO long! I might just need to get it! I love all the pretty colours coming with spring. I absolutely adore that colourful clutch with the pom pom trim. Love your picks…you have such great taste. Ok I seriously want it all. Spring is the best!